Dragonfire Farm: Red, White, AND BLUE! Rouge et Blanc DF is the first of what we are confident will be a long and illustrious string of Dragonfire bred USEA Young Event Horse winners. 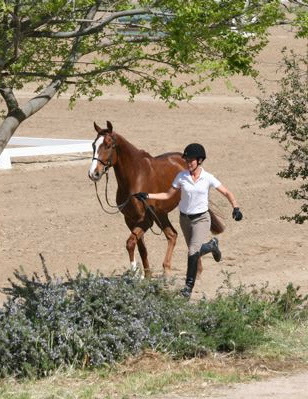 At the International Spring Three Day Event and Horse Trials At Twin Rivers Ranch, Rouge et Blanc DF, or "Roger" as he is known around the barn, embarked upon his first competition under saddle. Entered in the Four Year Old Young Event Horse class, Roger was up against several quality entrants with show experience already under their belts going into this competition. But Roger's level-headed nature made him a predator in the show ring, despite his inexperience. 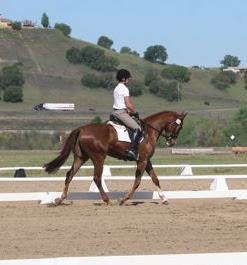 He was a pure to joy to show in the Dressage portion of the test, and was quiet and relaxed during his conformation judging. But where he truly shined was in the jumping phase, where he was absolutely stellar. His careful nature, combined with his willing and easy going attitude, made him a stand out over all types of fences he had never seen before and gave the judge cause to score him much higher than anyone else in the class. Personally, I was grinning from ear to ear as we jumped the course, because he was such an amazing combination of easy to ride and outrageously talented; the oil and vinegar of horses, so to speak. Of course, Roger is the product of a carefully thought out formula of speed and agility combined with beauty and trainability. In this combination lies the perfect Event Horse. Roger's sire, Dragonfire Kirin, is the epitome of an over-achieving winner in the show ring, (just like Roger) taking home blues from his very first outing. Roger's dam is of classic race lines such as Seattle Slew, Bold Ruler and Native Dancer. It is of little wonder that Roger has what it takes to excel in today's very competitive sport arena. We have bred other such crosses, but Rouge et Blanc DF is the first that I have had the pleasure of competing myself as the others have sold on to wonderful amateur riders at young ages. Roger, and his stablemates of young Dragonfire superstars, are available for purchase for those who not only wish to win, but want to enjoy the journey as well. Roger shows his Morgan trainability during his first ever Dressage test. Roger being obedient and flashy in his jog.... what a combination! Fantastic form and an easy attitude. A light and airy gallop seals the win for Roger.